It is GIVEAWAY TIME ~~HOORAY!!! For this giveaway, we teamed up with Chicnova.com – the adorable online boutique which implies beautiful and modern design. And now they are offering one of our beloved readers (YOU!) a $50 Voucher to their shop!!! Finally got myself a pair of white sneakers, thanks to Chicnova! Pretty studded necklace from Stradivarius! i love the denim vest and spiked bangles , im craving for denim vest !!! I really love your floral shorts!! i want you short,top and light outer! you look so damn cute! and by the way, i love your lilac top! it's pretty alright! i love color of the sweater!! love mint!! gowigasa and chicnova really have great stuffs..!!!! wish gowigasa will have shoes collection too..
Can I have that shades even before they go on sale? I can definitely see both my sisters in it! and okay ce, count me in for the giveaway! and my favorite item is definitely " Tropical Floral Baseball Jackets with Contrast Collar ".. It is going to be spring here and my elder sis is coming over and this jacket is just so spring! Oh my.. Floral Shorts is a must have!! Seriously Chicnova is so nice, too many good stuffs! "Faded Wash Slim Pants in Leopard Print"
"Button Detail Bodycon Pencil Skirt in Denim"
"Vintage Metal Running Man Ear Cuff"
"Bright Color Sleeveless Dress with Low High Style"
"Black Oversized Canvas Totes with Rivets Embellish"
I love the Vintage Blace Faceted Gem ring. 1. Tie Dye Rip Denim Short with Raw Edge. 2. Neon Diamond Shaped Chain Clutch. 3. Vintage Oversized Sunglasses with Leopard Frames. I WISH I'M THE LUCKY ONE! (>.<)/ Thank you, Elle and Jess!! I love your shorts! pastel colour is amazing!! 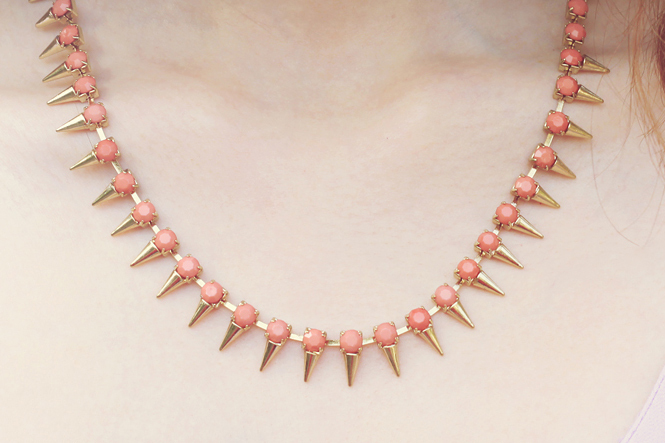 my favorite item on Chicnova is Golden Metal Spikes Necklace!!!! Fav : Neon diamond shaped chain clutch! 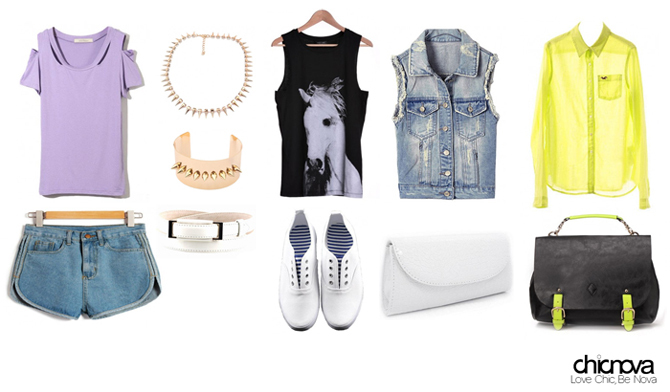 My fav item on chicnova is Denim vest. This is the kind of simply stunning dress I always term as 'innocently mature' dress, I define it as a really classic and formal dress and yet it will somehow give you an innocent look because of the collar and the chiffon. waaa… iwant the mint sweaterrr..
aaa im in love with the unionjack logo on the shoes since the first time i saw it!! 😀 somehow the shoes could be a statement to the whole look and it is so cute. My favorite item on Chicnova would definitely be the Bohemian Splits Maxi Skirt in Leopard Print (http://www.chicnova.com/bohemian-splits-maxi-skirt-in-leopard-print.html)! Can't wait for Gowigasa's new arrival! been in love with this since I saw it on Lookbook! can't wait for your Gowigasa new arrival and craving for this shorts!! I am a big fan of denim. Yaaay!!! everything will look nice on you! thanks gowigasa and chicnova !! I'm addicted to pretty much all of the leggings! my fav item : Pretty studded necklace from Stradivarius for my girl friend.. Damn! I love this Golden Metal Spikes Necklace much!!! So unique! xoxo ♥♥♥ Have a nice day everyone. fav item : lilac shirt. Just ONE of my favorite items! Such a great store! Like : asymmetry . It looks better when we try a new trick, "mix and match". Fairy white dress from gowigasa can we mix with coat http://www.chicnova.com/stripe-print-blazer-with-open-front.html .-front.html .for glasses I'm intresting with vintage foral print, looks unique + classic bag caramel from gowigasa. For gelt, herty bet looks matc. and dont forget wear red hat that cici elle ever used. For shoes we could use boots, try some new look. We can experiment our style, be dare ! after take a looooong journey finally my eyes goes to "A-Line Above Knee Red Vintage Dress"
OMG OMG i LOVE those shoes in chicnova.com and those skorts and dresses almost EVERYTHINGGG!!! See the LILAC SHIRT makes me remembered with my girlfriend. I´ve liked the pages on facebook (Dilan Dilir) and my favourite item from chicnova is http://www.chicnova.com/high-top-white-flatform-trainers-with-rivets-detail.html , I´ve always wanted a shoe like that! From Paris with Lux: Creating Our Own Perfume at Givaudan Perfume House!